Ramola's computer was working fine yesterday. But this morning, her computer stopped working. What she saw on her computer screen was just dark blank screen. Nothing, not even a BIOS details. What could've gone wrong? She called his friend Kevin, who's bit techie. He visited her leaving all his work. He checked her PC and finally told her, her motherboard's capacitor is dead. She was worried about her data on her harddrive which were more important to her. She wanted them at any cost. Kevin took out her harddrive which fortunately was working, Kevin backed up all the data off the harddrive,burnt it into some optical medias. He even changed her new motherboard and luckily same drive worked for her without hassles. Ramola had to pay some $100 dollars just for getting her data backed-up. But how did he do that? 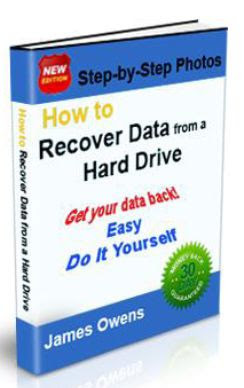 I want to thank Jim Owens for providing me with his best selling ebook called 'How to recover data from harddrive' and thanks Jim for letting me distribute this ebook on behalf of my readers. I really appreciate his greatness. This ebook has all details which any newbie could learn quickly. It's all step by step instructions with 90% photographs and 10% description. That's not boring right? It's extremely helpful to solve your computer problems easily. Glad the ebook has helped and I hope your readers enjoy. Thanks for the nice words and good luck.